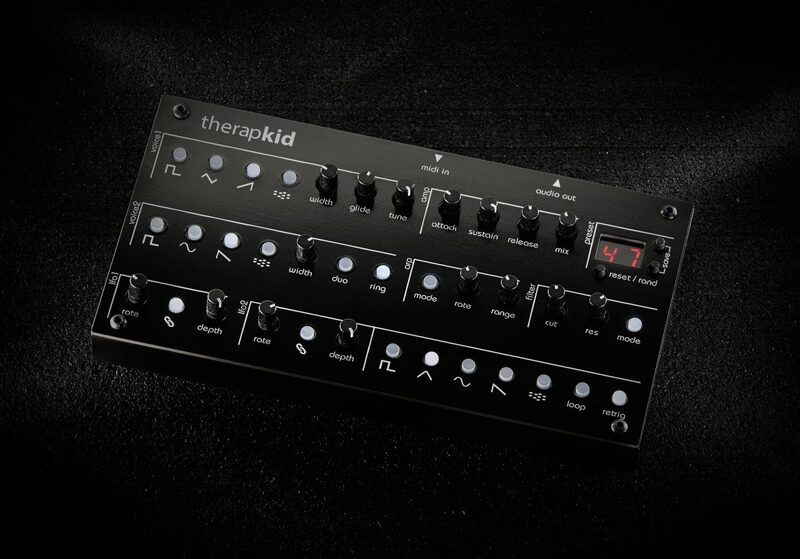 TherapKid is a powerful & affordable duo-phonic synthesizer inspired by the mighty therapSid. The first generation of SID (6581) had a wonderful gritty distorted filter but the later 8580 had a much stronger filter (more resonance). TherapKid offers a digital take on the best of both worlds with a strong filter resonance and 6581-like gritty tone. TherapKid has 2 voices, each voice consisting of 4 oscillators. In duophonic mode you can play 2 notes at once, in mono mode you can detune them. But you can take things further by detuning each of the oscillators individually to form chords or drones. While the wavetables are 8Bit, they are processed by a powerful 96MHz 32BIT processor and put out of a 16BIT DAC with oversampling and filtering. This formula of retro sound generated by modern hardware allows for plenty of summing headroom, a rich sounding filter, and complex modulations.